Untitled Print, Garrick as the Drunken Sailor, Samuel Wale, 1770's-1780's, British Museum. 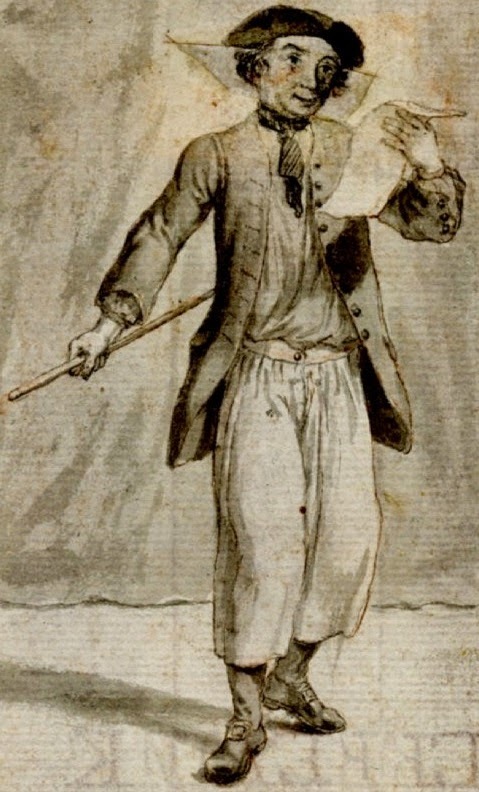 David Garrick is once more portrayed in a sketch (likely a study for an engraving) as his character the Drunken Sailor from "Britannia, a Masque." In this piece, Garrick is shown with a cocked hat pointed to the front, short and curly black hair, and a short black neckcloth. Like the last piece, this one also shows him without a waistcoat. Garrick's jacket is single breasted with large buttons and slash cuffs. The white trousers are shown with a clear button fly front, a detail usually left out of period images. A single large button at the top is the chief fastener. Again he wears black stockings, but these shoes have rounded toes and rectangular buckles. In his right hand, Garrick wields a stick. What we might call "copyright infringement" did exist in the eighteenth century, but they were loosely enforced. Often you will find images lifted wholesale by other printers. Most famously this was the case with Paul Revere's Boston Massacre engraving, which he had copied from a rival printer. It may be tempting to say this is true of Garrick's Drunken Sailor as well, but the differences are more stark. 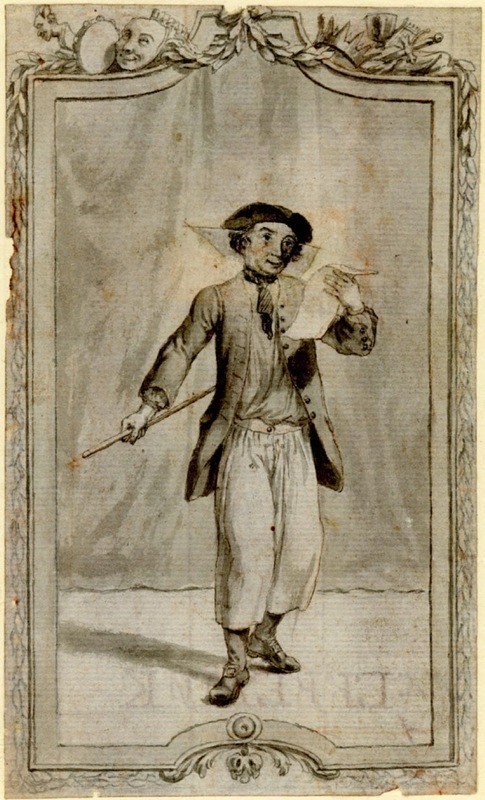 The sailors wear typical sailors' clothing, but of two different varieties: slops v. trousers, cocked hat forward v reversed, even different hair color. Their poses are different, and the borders are apples and oranges. More than likely, these were not copied from each other, but riding the coattails of Garrick's success.